So we've determined that 58% of enterprises which have adopted RPA are satisfied with both cost and business impact (see recent post). But how does this differ by business processes? 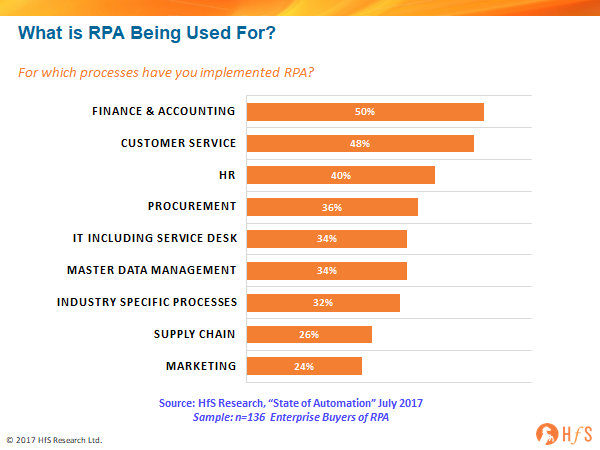 IT processes and apps are clearly the biggest beneficiaries of RPA. There's nothing like music to the ears of cash-strapped CIOs and CFOs than prolonging the life of those once-expensive IT systems that just don't integrate with each other. Plus, isn't it great to make band-aid patches over those spaghetti codes to keep those cobol monstrosities functioning for a few more years yet? Suddenly that "technical debt" doesn't feel quite so bad. The thing about writing off legacy, means you really only write off the stuff that just doesn't work anymore... RPA is highly effective at prolonging the life of legacy systems by recording actions and workflows to give these things a new lease of life, allowing for technology investments to be made elsewhere (read our recent example of NPower). Marketing functions have a lot of unnecessary manual fat that can be trimmed. There is one function that perennially suffers from excessive manual work and real issues integrating systems and processes, and that is marketing. Simple tasks (or tasks that should be simple), such as linking together databases of customers, subscribers, and prospects to align with campaigns, collateral, automated emails etc., are the bane of every CMO's existence. So... rather than spending millions on consultants to recreate new processes, CRM capabilities and training people to use them, why not get what you have working better, while you figure out where to make those really valuable marketing investments in the future? Finance and Accounting disappoints from a cost take-out standpoint. With only 40% of enterprises satisfied with the direct cost impact of F&A, we can conclude that many of them have their expectations set too high that RPA will drive short-term headcount elimination. On a more positive note, half of them are happy with the business value impact of RPA on F&A, so clearly there are process improvements, just not enough to remove the human cost of administering them immediately. Considering F&A is the number one process being used for F&A today (it dominates 50% of installs) it's clear that the suppliers are playing the cost take-out game too aggressively and leaving many customers disappointed. As with outsourcing, it's one thing separating tasks and removing workload elements from staff, it's another being able to remove headcount simply my improving or digitizing processes. Customers must take a more transformative view that if they can free up 50% of an employee's time, they need to focus on refocusing her/him on alternative activities. That is where the value is to be found. RPA satisfaction in Customer Service functions is mixed. For a function that can truly benefit from intelligent data and digitized processes, it's surprising that barely 50% of customers are experiencing either cost or business value benefits from RPA. The reason for this is two-fold: firstly, customer service functions are too mired in the legacy practice of managing shifts of low cost agents, whether they are inhouse or outsourced - and have little time or funds to investigate the value of RPA, which may require upfront investment and longer term planning. Consequently, with this short-term mindset to cater for, most the call center BPO suppliers have little pressure to change how their sell their services, if their clients are not clamoring for RPA solutions. While we are seeing significant interest in chatbots and virtual agent solutions, and established automation vendors in the call center space, such as Nice, have established relationships with many customers, the whole call center space seems to be lagging behind other functions when it comes to embracing how to leverage the benefits of RPA effectively - which could be significant when you take into account the dysfunctions across customer interaction channels. The main issue with RPA, in today's market, is this misconception that customers will make significant headcount reductions in the short-term. With outsourcing, the cost savings are staged carefully over a 5 year engagement as work is moved to cheaper locations, better technology and processes are introduced, in addition to automation, and the processes are re-mapped over time to allow for work to get done, ultimately, with less people. Simply plumbing in RPA and not having a broader plan to transform the work, pulling several other value levers, in addition to the patching of processes and digitization of manual work, will likely result in a mismatch between expectations and reality. RPA needs to form part of a broader strategy to automate and streamline work, where people, processes, analytics tools, SaaS platforms, outsourcing models and carefully developed governance procedures, are taken into account as part of the broader transformation plan. RPA needs to form part of a broader strategy to automate and streamline work, where people are taken into account as part of the broader transformation plan. Thanks Phil for the great insights as always! Should companies look at ROI before taking up RPA as an initiative across their organization or is it a given based on the industry trends and a broader view needs to be taken by the CIO? I am asking because there is a lot of effort spent today in silos by individual business functions or IT, trying to do proof-of-concept(s) for one area . As you have rightly mentioned, its ends up like a plumbing work. your views? Thanks Phil, Great evidence for marketing RPAs. My experience though is marketing is last to implement those. Do you have data or case studies that support that evidence? Who do you think needs to see this to understand RPA is the way forward? CMO or CFO? Thank you Phil and HfS team for the insights. This data is very compelling and backs the conversations surrounding what processes to choose for automation with the numbers. One more question though on the IT, while we agree RPA will help accelerate Digital for Legacy Systems and extend the shelf life of legacy, what % of the IT satisfaction stems from use of RPA on top of Legacy systems (RPA for Modernization) vs the Service desk (RPA for IT Service Operations). Would it possible to provide that view too? With RPA like any new technology or concept, the justification and expectations must be realistic. For example, make sure to include one time costs as well as software licensing costs (Bots are not cheap!) It is also critical to make valid assumptions on the implementation time as well as the actual disposition of the "displaced" personnel. Some can handle exception processing, others may be redeployed to other tasks. The financial analysis should have realistic assumptions around the disposition of the resources. The case should be multi-year. On the other hand, RPA provides some improved metrics and can facilitate the improvement of the process. In most ccases, it is recommended to automate before "fixing" or re-engineering the process. After the implementation, using the data generated by the bots, the process can be improved more efficiently. This should be factored in the multi-year financial model. Setting valid expectations is critical. Some areas may yield significantly better results than others within F&A or other business areas. Don't assume the same results can be extrapolated to all functional areas that are affected by RPA. Phil - thanks for the insight. Very helpful. I hear lot of noise on RPA in Banking. However, my personal interactions with many global banks has been discouraging when it comes to scale. All are doing it. But not sure why they are willing to look at larger-scale implementations - their approach is piece meal. Another feedback is the outcome - the productivity of 2 or 3 FTEs here and there and not very high. This is also because the processes in banking are matured and fragmented. I know there is only one exception to RPA story in banking who has implemented at scale. The bank is in APAC and you will see them talking in every RPA forum for banking. Your views please. thanks. Very interesting read. In a rush to imitate Industry trends around RPA adoption, Organizations tend to underestimate the power of Point based and Bolt on Automation solutions, which may deliver a same or even a higher benefit with the lesser cost. "LET'S GET PRACTICAL"". And that holds pretty true for the RPA adoption scenario in Finance & Accounts.